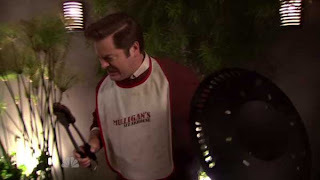 So I was watching Parks & Recreation Thursday night - best show on TV (well, best sitcom, which is like saying "the smartest monkey" or "the least sweaty Kirstie Alley appendage") - and Ron Swanson and Rob Lowe's character (hereforth referred to as Rob Lowe) were having a burger cook-off. Rob Lowe made a gourmet turkey burger with fancy trimmings while Ron's entry was simply a dirt-cheap beef patty in between two plain buns. Of course, everybody chose the red meat. As Ron said, "Turkey can never beat cow, Chris". And that pretty much settled it: Cow is king. And Rob Lowe's character on the show is called Chris. Anyway, like Chris, we've all worked really hard to make something healthy and/or disgusting edible when cows and pigs are everywhere practically begging us to ingest them. Take pumpkin pie. Some people like pumpkins, but they are wrong. They are not food. If you have to add buckets of butter and sugar, you need a better base. Strawberries and apples seem to work. Now I realize that some people love their pumpkin pie, and to each his or her own...as long as he or she doesn't try to guilt me into a slice because his or her great-grandmother had a special recipe. Very probably the same recipe that could be applied to turn the recipe book into some glorious pie, and I wouldn't be very interested in that, either. It's no coincidence that the best compliment that you can receive on a pumpkin pie is that it doesn't taste like pumpkins at all. For goodness sake, they sit on front porches for months and the homeless never move on them. That alone should tell you they are not food. Potatoes. Common as air, and about as joyless of an eating experience. Of course, when you pile on the cheese, bacon bits, sour cream, chives, and butter it's another story. It does make me wonder if something else should come with my steak, though. Like french fries or an angioplasty. Cauliflower is another one. I love broccoli, but cauliflower is essentially an albino broccoli that grows in dark, damp places, like sewers. So what do you do with it? Cheese. Once you have significantly more cheese than cauliflower, it becomes food and is okay to eat in small amounts should your survival be at stake. It is a little known fact that most cauliflower is foraged by people who get lost in the sewer - so if you plan on doing any traveling under ground, don't be the guy who forgets cheese. And try to avoid the mole people, they will try to sell you useless crap. Last time I thought I'd scored a deal, but when I got to the surface I realized it was Problem Child 2. I won't even start down the road of tofurkey or any other meat substitute. Eating something doesn't make it food. A table leg can be eaten, as one end of my dog has demonstrated - but, as the other end later proved, it isn't a viable (or sustainable) food source. Give me the real thing - be it chicken, beef, pork. Unless I'm at McDonald's, in which case I'll have two of whatever that McRib thing is. As is far too often the case, I'm with Mitch Hedberg...somebody needs to tell the turkeys to just be themselves. Beef is for burgers. Turkeys are for giving kindergarteners something to do with construction paper and hand tracings. They shouldn't be moonlighting (or is it sunlighting?) as beef or sausage, mostly because it leaves the door open for tofu to play dress up with their feathers. 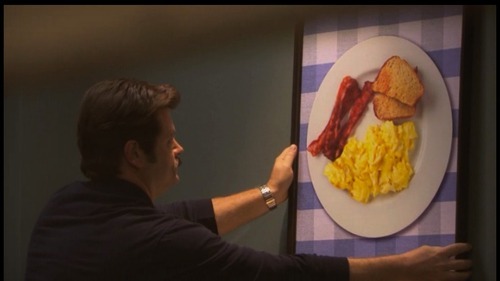 Ron Swanson has a picture in his office of bacon and eggs (see below) - because breakfast is the most important three meals of the day - and you can bet a rat's mustache it's not turkey bacon on that plate. That's got to be the funniest post I've read all day! The "cow beats turkey" comment made me laugh even more than faking pulling his own tooth last week. There are so many quotables in this post. It's got to be your best ever. 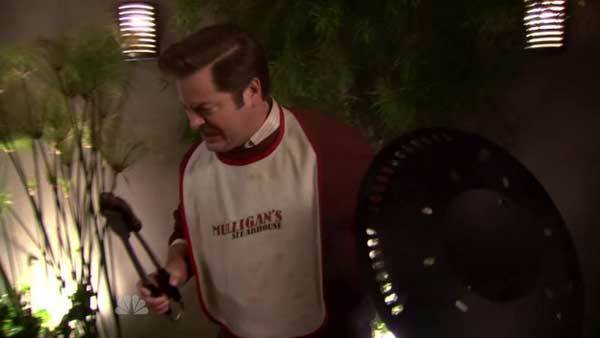 eater did a little piece on the Ron Swanson turkey burger.